Manchester Massachusetts also known as Manchester-by-the-Sea is the first Cape Ann community you will find and it is located just twenty miles north of Boston. It is bordered by Beverly, Wenham, Hamilton, Essex and Gloucester. 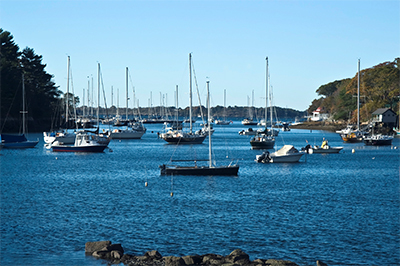 This quaint residential seaside community is positioned around one of the most beautiful New England Harbors on the North Shore, Massachusetts Bay. This little town originally thrived as a fishing community in the early years, fed by the waters of the Atlantic Ocean, and gradually through development of land and homes became a summer vacation community. Presidents, princes, and ambassadors were among the many distinguished people who vacationed here. The architecture resembled the traditional Queen Anne style with shingled summer cottages along the shoreline. Elegant hotels were built in town which attracted notable persons as well as those from the world of theatre. Manchester has miles of shore line and is best known for its commercial lobstering and yachting but the visitors are attracted to the beautiful beaches and historic buildings as well as the fine dining and unique shops. Manchester-by-the-Sea has something to offer for everyone regardless of age or ability. You will find many beaches, some with amenities and some without. There are parks and playgrounds, conservation land and trails. The Manchester Historical Museum provides walking tours of Historic Manchester, a visit to the Trask House, owned by one of the most prominent merchant ship captains from the 1800's or a tour of the Seaside No. 1 Firehouse also from the 1800's, now a museum for antique fire engines. For those who enjoy boating you will be drawn to the Manchester sailing association where one can learn the sport of sailing and for those who enjoy groups or organizations the Manchester Community Center is a place where residents gather to meet, work and socialize. Manchester offers both public and private education. The Manchester Essex Regional School District is the public school system and consists of an elementary, middle and high school offering grades pre-kindergarten through high school. You will find four private schools offering Pre-kindergarten through eighth grade.